Paul Di Resta's impressive display in the Singapore Grand Prix has boosted his driving profile, according to his manager. The Scot, 26, finished fourth on Sunday to claim his best-ever finish. And Richard Goddard feels Di Resta picked the perfect time to showcase his talents. "It highlights the talent he has, he was fantastic in qualifying and it was a fantastic drive from start to finish," said Goddard. Di Resta started the race in sixth position the on the grid, equalling his best-ever starting position. Goddard, who was appointed just two weeks ago, believes the Scot could not have picked a better time to shine. "It highlights the talent he has, although every team has been able to see how consistent he is anyway and every team wants consistent qualifiers and consistent racers," he said. 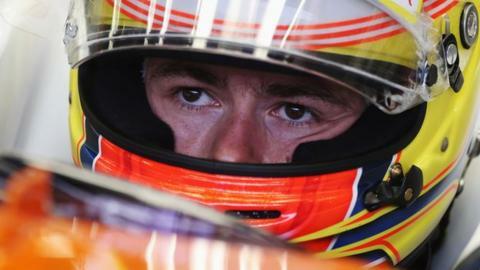 Goddard sees similarities between Di Resta and one former world champion that he used to represent. "It is one of Jenson's [Button] massive strengths that for lap after lap he produces the same time, and it's about getting the majority out of the car and also being clever in the use of tyres," Goddard said. "Paul has also been able to demonstrate that, and the closer you finish to the podium and are on the podium, that's when you get recognised by more and more teams. "So that's what his result yesterday will do for him. It will give him a lot more visibility." Di Resta feels his achievements are greater because of the difficulties of working with one of Formula 1's smaller teams. "I enjoy being part of this team, even though it's hard work because the infrastructure we have is not quite what others have. "But we've shown when you gather it all together you can get the performance, it's just making sure that happens weekend in and weekend out." The Scot, who is currently 11th in the standings, is contracted to Force India next season but the driver himself has lofty ambitions. "I would like to think I am capable of stepping up to one of the bigger teams," he said. "I have raced against the drivers at the top in the past and have had great battles with them and beaten them, but I'm not getting carried away. "When the time is right hopefully someone will step up and give me the chance to do that because I want to be in a car that wins races week in, week out."